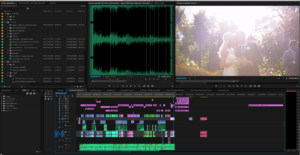 Music choice is a huge factor in wedding video production! It can complement and emotion, energy and pace. So how do we choose, and how do we make it work? Wedding Video Music – Who Chooses? For every wedding film our couples will choose about 10-15 tracks. We’ll use 8-12 of them in the feature film, and then another one or two for the highlight reel. The level of control is up to the client – they’re welcome to dictate the specific tracks for each montage section, just choose the highlight reel track – or leave it entirely to us! We love it when a couple chooses (it matches the emotion of the day every single time, guaranteed!). And if we choose, we’ll edit the feature film first and understand the story we need to tell – was it about sentiment, fun, or both?! For shorter days of filming (e.g. 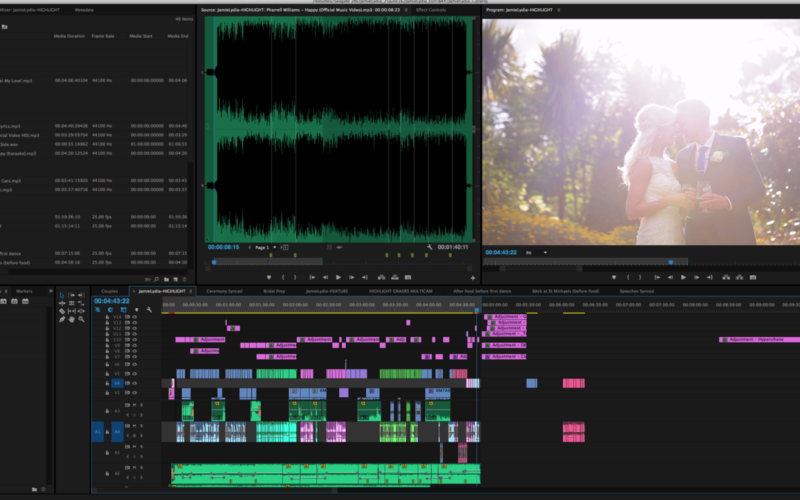 a half day wedding video package) a highlight reel can fit nicely into a single track. But for full day packages (Silver or Gold) there’s so much to fit in! We use clips from the speeches and ceremony to show the emotion of the day and the personality of the couples – but it can take up a lot of runtime! You’ll see some sections where there are almost breaks in the footage – this is where it cuts to the speech or ceremony footage. We try to use instrumental sections underneath these parts (or else the music competes in the same frequency range as the voices). The image above is from Jamie & Lydia’s wedding video at St Michaels Hotel in Cornwall. The extension here isn’t quite as significant, from 4 mins to 4 mins 30 seconds. You can’t see it in the picture, but we also try to stagger the positioning of the vocals to help tell the story of the day – although the highlight reel is only about 4-5 mins long, it can take a couple of days to complete, start to finish!